Qasida (also spelled qasidah or qaseeda), is a form of poetry from pre-Islamic Arabia. A Na`at is a poetry that specifically praises the Prophet Muhammad ﷺ. Many of the famous scholars in the earlier days of Islam wrote Naat. These are a collection of qasidahs/naats/hamds published by ASJA Trinidad that have survived the generational loss of the urdu language skills by contemporary Caribbean Muslims. They are still used both for private devotional reading in Moulood (Mawlid) and as lyrics for music. 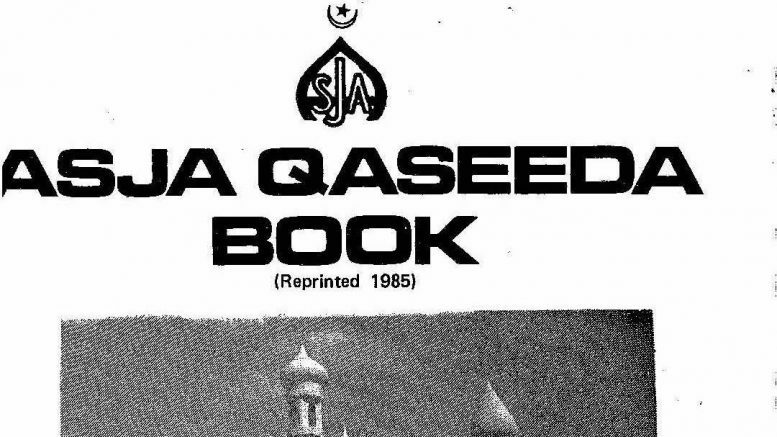 The compilation of ASJA Qaseeda book was undertaken by Imam Hameed Rajab (RA), of Dow Village, California, Trinidad. Imam Rajab was the Imam of his district mosque as well as leader of ASJA’s Imam Council for many years.